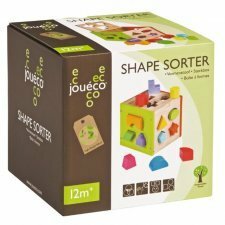 Jouéco is a Dutch company and their wooden toys are educational and contribute to the motor and creative development of children. At Jouéco they are very conscious that every minute forests that equal the size of 36 football fields disappear. That is why an ever increasing number of their products are FSC® certified! This means that the wood originates from properly managed forests. FSC® forests are very different than other forests and most comply with a long list of criteria. By using FSC® certified wood, we contribute directly to the protection of our worldwide forests and to a healthy living environment for both people and animals on earth. A very extensive Activity Walker. Because the handlebar is in front of the rear wheel, this Activity walker is extra safe. Your child can enjoy playing. 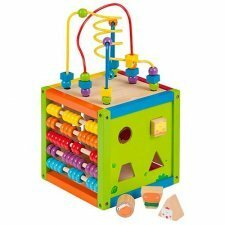 We have added a shape sorter, a bead track, a labyrinth puzzle and many more activities. So this set is very complete. On the backside of the Activity Walker we created extra space for you or your child to store extra toys. To make sure nothing can fall out, there is a net attached. 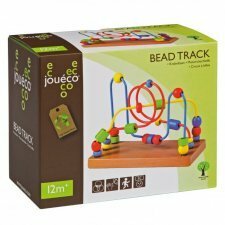 Introduce your child to different shapes that can't get lost with this exciting bead maze. Sliding the beads over the maze provides excellent motoric exercise for your child and also helps develop hand-eye coordination. Build and stack the most beautiful buildings with these colourful blocks. This bucket contains no less than 100 pieces in many different shapes. Perfect for the stimulation of your child's creative side. 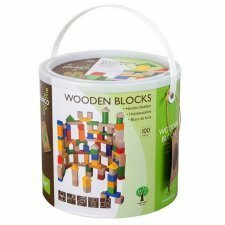 When they are finished they can neatly store the blocks in the bucket. The activity cube is a real all-in-one toy. Counting window, bead maze, shape box, everything worked into three in a row. Has your child finished playing? The bead maze simply disappears into the cube and then it is closed. 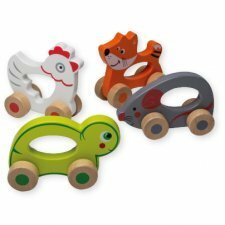 Real wooden rolling animals for the littlest ones. The handle makes it easy to hold and ride. The robust design means that the children can use the cars for support while driving, without problems. Available in three different colours. Animals: chicken, fox, turtle or mouse. 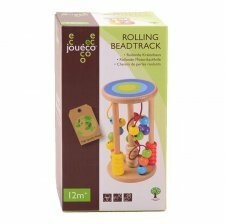 Your child will love the Rolling Beadtrack. Their eyes will be drawn to this track time after time because of the joyful and bright colors. They will learn the logics from each part of the beadtrack and when they grow older they can even learn to count on the small build-in abacus. Each time they touch the beadtrack it will roll over. Unknowing, children will learn to crawl. All children just love to grab things so that they can make out shapes and features. There is an awful lot to find out with this shape box complete with 13 different shapes. Have all the shapes been identified? Now the fun starts by pushing them into the correct shape on the shape box.